A couple of weeks ago Shay and I were lamenting over the fact that our big kids were heading off to kindergarten (because weren't we JUST pregnant with them?!?!) and decided that it would be a fun idea to host a Kindergarten Kickoff dinner - something really special just for the kindergarteners and their moms. We put out note cards - and everyone wrote what they thought each kindergartener was going to grow up to be as well as a word (or two) to describe them. When the cards were filled out, they dropped them into the kids little bags. This is a chalkboard that I made for my classroom - and it is actually a piece of "art" that I bought at a thrift store for about $2. I covered the glass with paper, taped it down and spray painted the frame yellow. After that was dry I peeled off the paper/tape and painted the glass with two coats of chalkboard paint. Easy! On the table, I wanted the kids spots to be super cute and bright, so I bought a package of 12x12 primary cardstock and used them as place mats (I used the same cardstock to create their little nameplates as well). I picked up three Fall garlands at Hobby Lobby and placed them down the center of the table and then brought my faux apples from home to mix in. I was in charge of decorations and Shay was in charge of cupcakes and OMG they were fabulous!!! She had a local mom make them and the toppers are the most delicious sugar cookies ever. And don't even get me started on the icing. They were perfection. I took no pics of the kids eating, but all us mamas had Cobb salads (and yes.... that's my green tea lemonade... hahaha) and all the kids had pizza and fries. One of the most unanticipated gifts of motherhood for me has been this amazing group of women that I am blessed call my friends. I was, admittedly, not a "girls girl" in high school and/or college. I have a LOW tolerance for drama and wasn't very successful at finding girls with similar priorities so I just kind of gave up. 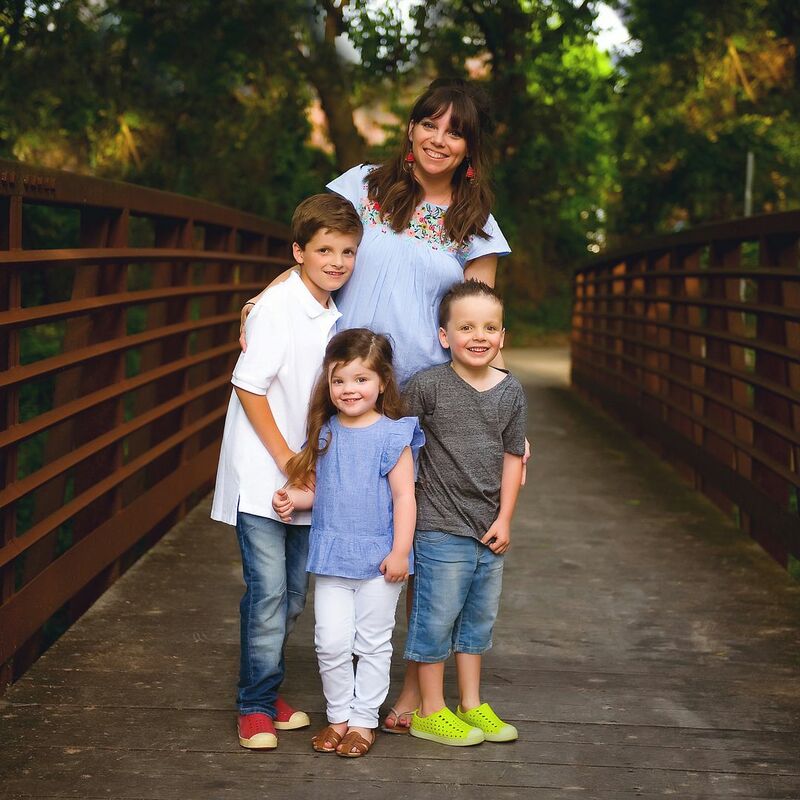 Fast forward a few years, and what started as a Beth Moore Bible Study at Starbucks while I was pregnant with Luke has blossomed into deep, authentic and long lasting friendships. This group of girls has prayed for my kids before they were born, we've cried with and for each other and have had our fair share of laughs. We hold each other accountable, build each other up and love each others kids. I love that our friendships have fostered great friendships among our kids as well. 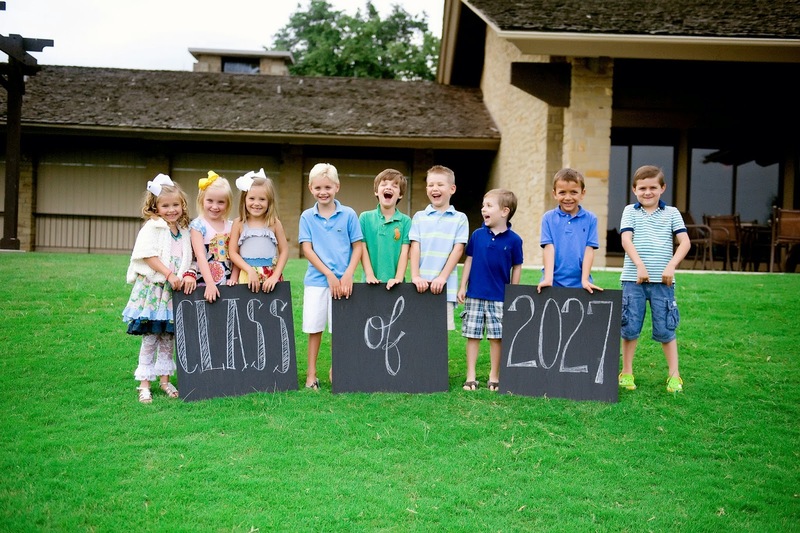 It was so special to get to send our first batch of babies off to kindergarten with a bang. You girls are my rock. I cannot imagine going through mommyhood without each and every one of you. Thank you so much for being the creative force and genius behind our party. Love you so much friend! I can't wait until around 2032 when we're in-laws ;). 2032 sounds like a PERFECT year :) Kensington was telling me yesterday about her future plans. hahaha Love love love that sweet girl you have! I LOVE this! You did such a great job with this party... I'm going to have to steal this idea from you when my son goes off to kindergarten in 2 years. Amazing!! I have already sent one of my kiddos off to kindergarten, but really didn't know anyone else at the time. Since then we have met a bunch of people in the neighborhood and there is a whole crew starting with my son next year. You have definitely given me some inspiration! Love it! The dinner was so nice!!! The decor was fabulous and the cupcakes...yummy!!! Love you sweet friend! I'm still cracking up about y'alls girls with the cupcakes.... especially Ebby Lee :) Still can't believe they're doing to KINDER!!! Love you, too! Oh my gosh that is so creative and cute!!! You did a great job, mamas!!! I am pinning ideas for sure. :) My tot is starting "preschoolers" for 2-3 year olds in September and I can hardly believe she'll look as old as these kiddos in 3 years. Those little kindergarteners are precious! You're so darn creative! I love reading your blog! What a great idea! You are beyond creative! Wish my kids were starting kindergarten so I could "copy" your idea but since my boys are 14 and 16 guess that's not gonna happen - they barely tolerate first day of school pictures anymore! Good friends are such a blessing - enjoy this new chapter of your lives! What a great celebration! 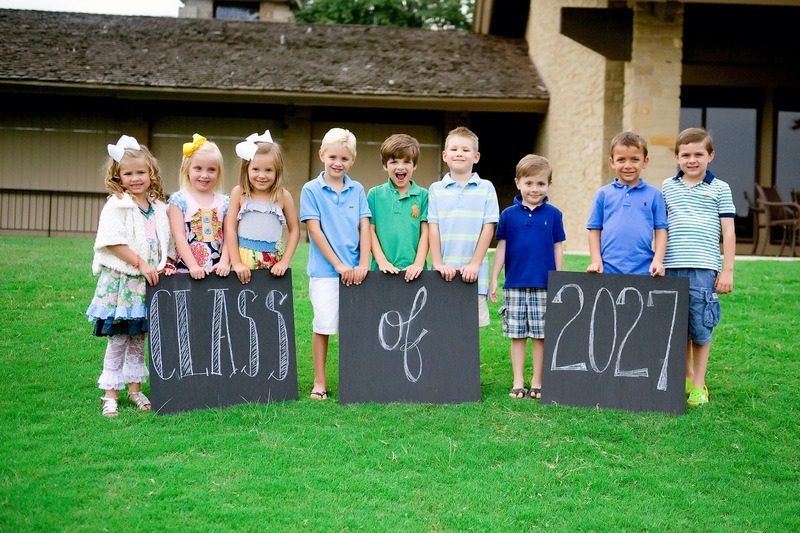 Those pics with the Class of 2027 signs are priceless. I have a feeling they will resurface at high school graduation. Enjoy every moment! It goes fast...I can't believe my "babies are going into 5th and 7th grades! What a wonderful idea. You are the party queen but you make it look so simple! And a close group of girlfriends: best.thing.ever. This whole event is beyond sweet! Tearing up over here! Reading this makes me want to cry. My "baby" is going into 2nd grade and it is so bittersweet. Precious! And what a great idea! I'm about tear up! Kindergarten is such a milestone and I can so relate! Once they start school things change so much. Praying for all of your sweet children as they embark on this new journey. The party looked like a huge success and your decorations were perfect. 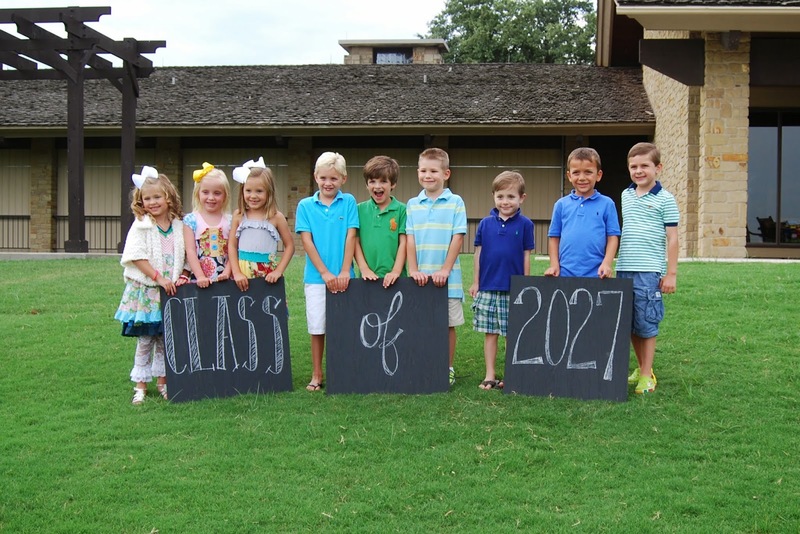 The chalkboard pics with class of 2027 will be a wonderful pic to look back on for years to come! Oh wow! I love this idea! My big girl is starting Kindergarten in a few weeks too! Thanks for your comment - it really was a super fun night. About the cupcakes... Shay makes DELICIOUS desserts... but she doesn't make cupcakes with detailed iced sugar cookie toppers :) The party was about and for the kids and she wanted to do something that would really get THEM excited - which these did. I give Shay major props for doing something that she knew the kids would love and remember. What a sweet, sweet post! I love the Class of picture- They each need it framed in their bedroom and you need to recreate it in 18 years! Such a fun idea! This whole post seriously melted me. What a perfect idea to have a kick-off dinner like this!! I too got all teary-eyed in the last paragraph! What an incredible blessing to have so many close friends that have kindergarteners as well!! I am right there with you in disbelief that Preston will be there this year. Time sure does fly! AMEN! Time FLIES!!!! Can't wait to see you TOMORROW, sweet friend! Fabulous! What a fun way to celebrate this new season of life. And yes! Girlfriends are SOOOOO important! Especially those that are anchored in Christ! Finding those kind of "grown up" friendships is truly a blessing in this crazy life! You girls are all precious...your love for your kids and Jesus is contagious and I love following so many of you! Your sweet comment made my day. Thank you! Oh my gosh. They are all so precious. I love the pictures at the bottom with the signs! Future senior high school video photo right there! What a fun celebration and how awesome that all you girls have been friends for so long and that you get to do this school thing together with all your kiddos! LOVED this post!!! It's a true blessing! Thank you, girl! This is amazing -- you are truly inspirational and a wonder woman/mama! It surprises me that mixandmatchmama didn't make the cupcakes herself from one of the recipes on her site, but the ones you ended up with sure look delicious! YES!!!!! Love everything about this post. We've got such a great group of kids, and I'm so lucky to call all of their mamas friends! Your last paragraph made me want to come right over in my blardigan and hug your neck. Thank you for the party! And the pictures! Such sweet memories. GREAT idea! We'll have to try and coordinate that! This is such a fabulous idea!! I loved all of your decorations, so cute and so fun!!! Those cupcakes look amazing!! I'm surprised thought that the Mix and Match Mama didn't whip up some fun back to school bundts or cupcakes herself! But those look amazing and delicious! Such a fun tradition to keep up for your other adorable kiddos too!! Thanks for sharing!!! Thanks so much for your sweet comment! And about the cupcakes...Shay makes DELICIOUS desserts... but she doesn't make cupcakes with detailed iced sugar cookie toppers :) The party was about and for the kids and she wanted to do something that would really get THEM excited - which these did. I give Shay major props for doing something that she knew the kids would love and remember. What a cute idea! I have to ask how you were lucky enough to meet a great group of moms? I am pregnant now and am a stay at home wife until baby girl comes but I would love to meet women who are also pregnant so we can enjoy the journey together. I live in mckinney as well. How did you all meet? I don't know what happened to my comment. Anyway, very cute, fun idea. Love all of the details!! You are a party planner after my own heart!! Might have to do this for my daughter heading off to high school. I love that my kids have life long friends whose moms are friends of mine! It makes growing up together fun! Are most going to the same school? I love this idea!! Looks like it was a fun celebration! Absolutely agree as the mom sending her second child off to high school. I miss the days you are in right now so much! 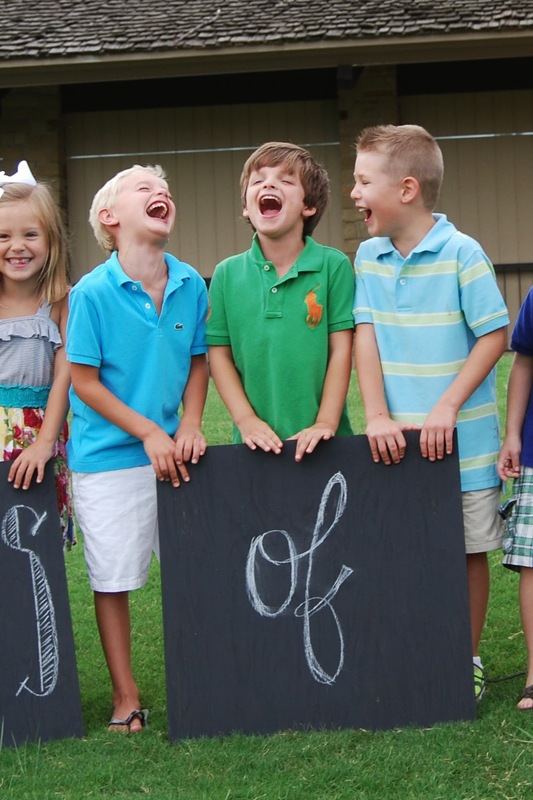 That yellow chalkboard frame is perfect, as well as your giant chalkboard signs! Such as amazing party!!! Great photos too! I love this post!!!! 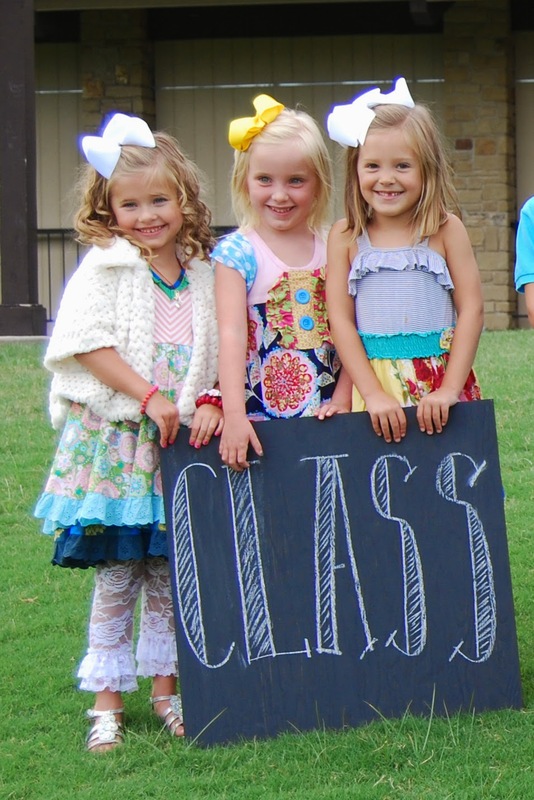 I would love to make the chalkboard signs. What size pieces of wood did you use? LOVE LOVE LOVE this!!!! You are SO creative and decorate so beautifully. Saving this for in a few years for when my little one heads to kindergarten (cue mamma crying now!). I'd like to know more about these chalkboards you're going to hang on the fence, and also what was in the goody bags for the kids? Thanks for an fun idea!